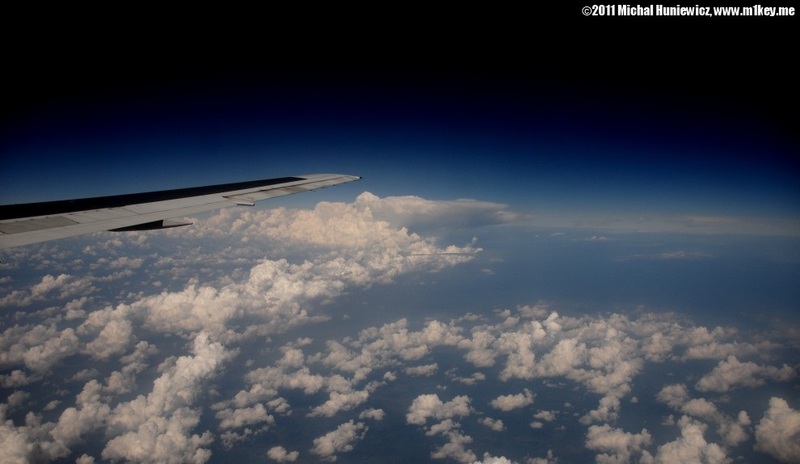 I visited Istanbul in late August 2011 just before the end of Ramadan, the Muslim month of fasting. 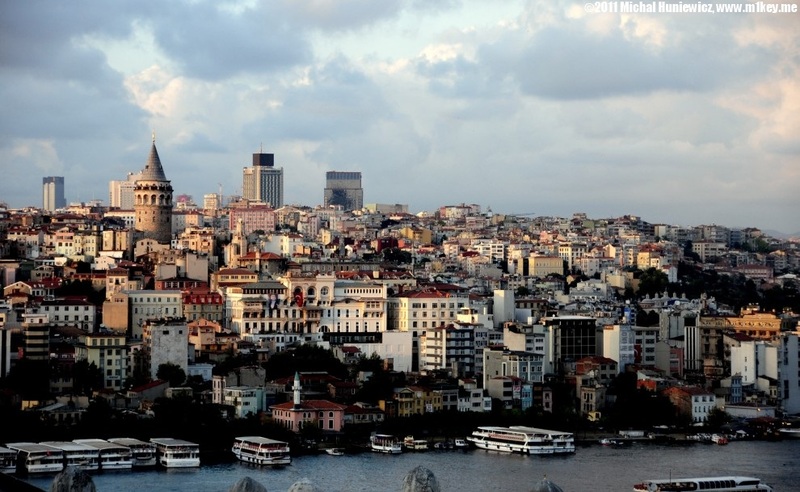 Istanbul is the largest Turkish city, being home to over 13 million inhabitants. The Bosphorus splits it in two parts, European and Asian. The area of Istanbul was inhabited even before the Bosphorus was formed - there are remains of settlements from as long as 7 millenia BC. 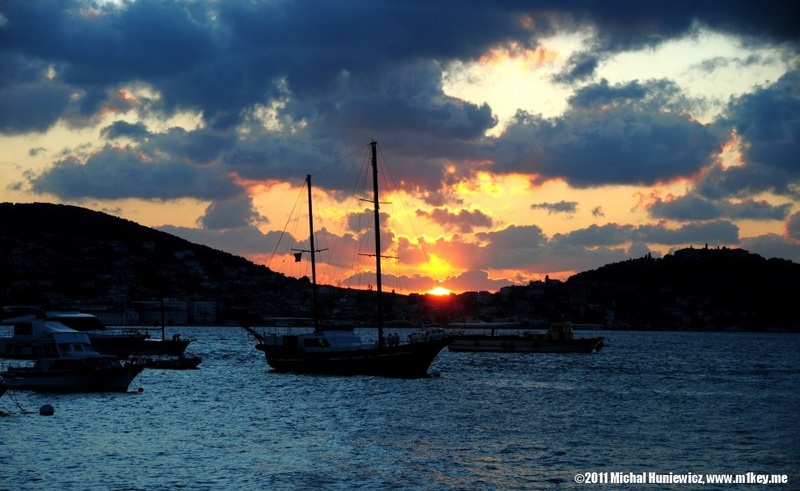 Greek settlers founded the city of Byzantium in 660 BC. In 330 AD the city became the eastern capital of the Roman Empire and was renamed to Constantinople. It became a center of Greek culture and Christianity. However, its power began to gradually decline, and it became the target of Ottoman Turks, who eventually conquered it in 1453. 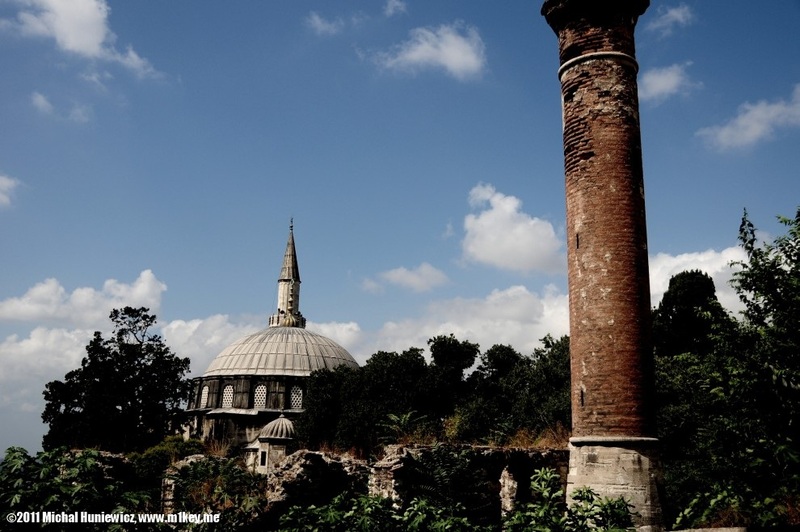 It became the capital of the Ottoman Empire. Now known as Istanbul, the city had a cosmopolitan society of many cultures and languages. In the 20th century, Atatürk attempted to westernise the country and turn Istanbul into a more modern city, sometimes at the expense of old buildings and original designs. 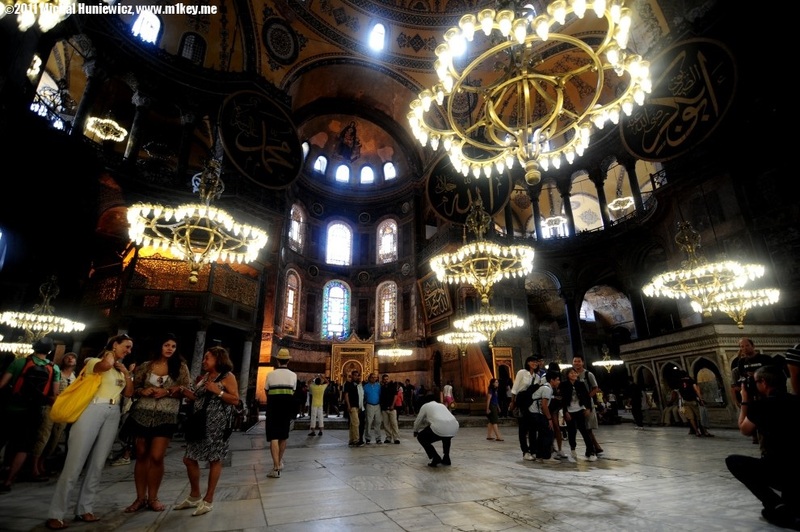 That was also when the original byzantine objects, which had become mosques, were converted into museums. It was the end of the empire, and of the harem, and the beginning of the Republic of Turkey. Many people left the city and it lost its cosmopolitan character. These days there are almost 3 thousand active mosques in Istanbul, and a vast majority of the population declares themselves as Muslim. There is only a small Jewish community (20 synagogues); most Christians have left too. While Ankara is now the capital of Turkey, Istanbul generates 55% of Turkish trade. 40% of Turkish taxes are collected in Istanbul. It's a powerful city in a powerful country with big ambitions and an army to support them. 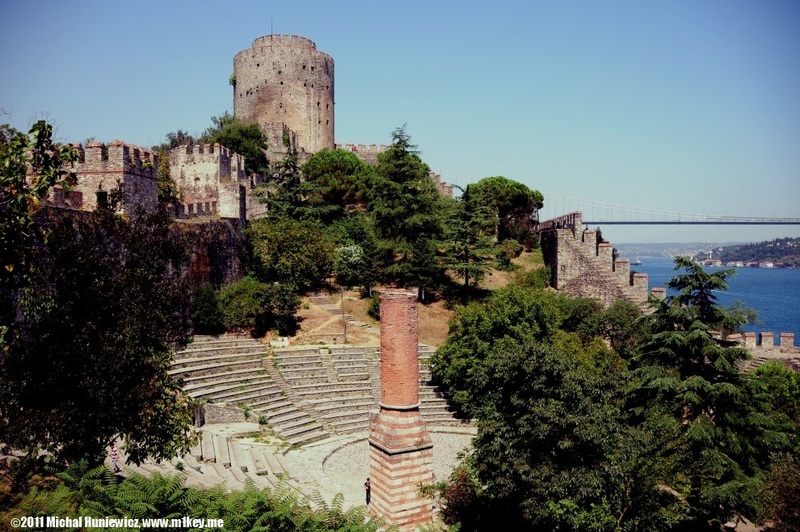 This gallery shows major tourist attractions and landmarks of Istanbul. I hope it will let you get a feel of the city and its history. 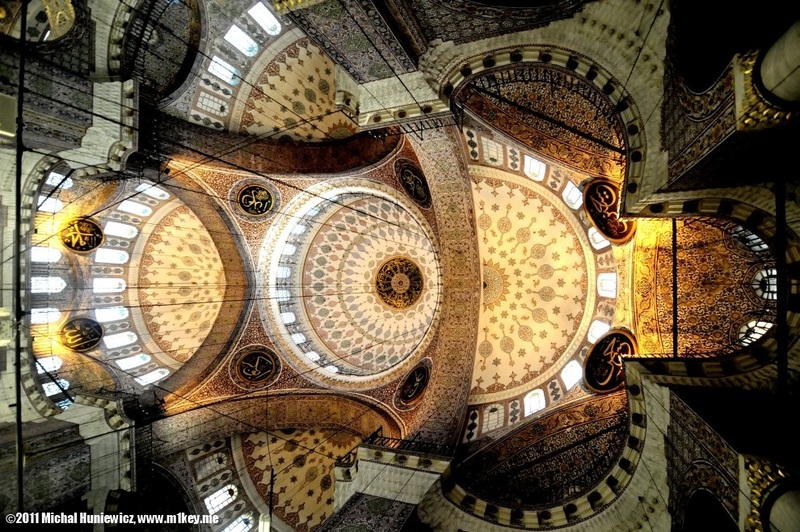 This is Hagia Sophia. 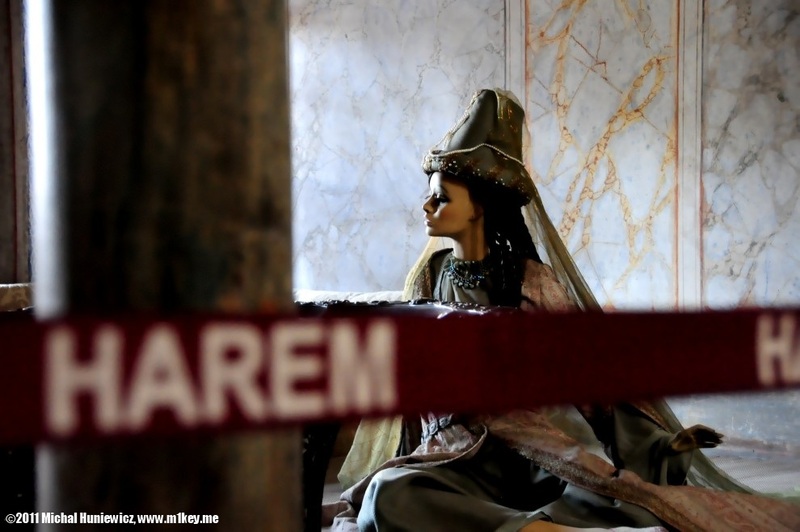 It used to be an Orthodox basilica, then a Roman Catholic cathedral, and, like many other churches and synagogues in Istanbul, was eventually converted into a mosque. However, it ceased to be one in 1931, when it was secularised, to reopen as a museum in 1935. The latter was done by the great Turkish moderniser and westerniser - Atatürk. 'Solomon, I have outdone thee! ', said Justinian, who ordered this basilica to be built in 532. It remained the largest cathedral in the world for a thousand years, until the Seville Cathedral was built in the 16th century. Hagia Sophia is not just massive - it's richly decorated, and some of the mosaics as well as frescoes have survived to this day. 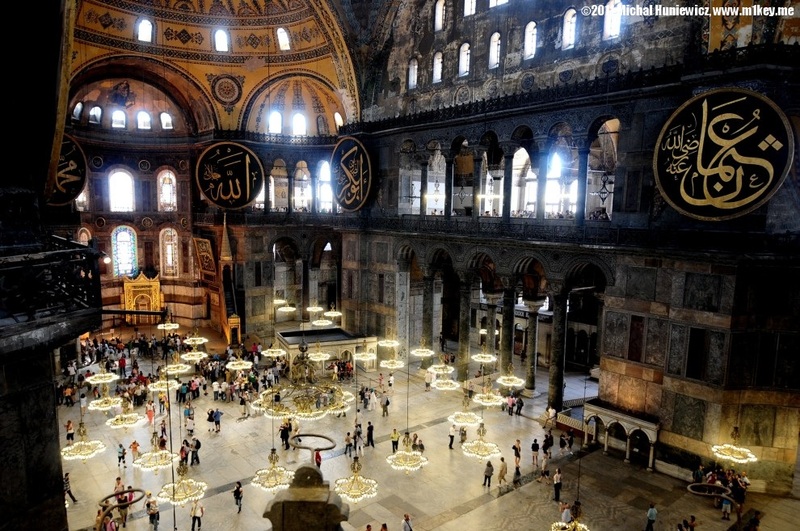 Hagia Sophia is one of the main tourist attractions of Istanbul. Located in front of the Blue Mosque, conveniently close to the T1 tram, it's surrounded by long queues of visitors and those preying on them - tricksters, selling them things they don't need; adults and children offering water for 0.5-1 TL (Turkish Lira); or men offering themselves to blonde Australian women. Notice the mihrab (golden niche seen behind the man in a blue shirt) and minbar (just a bit to the right of the crouching man) at the far end. They are typical mosque elements. 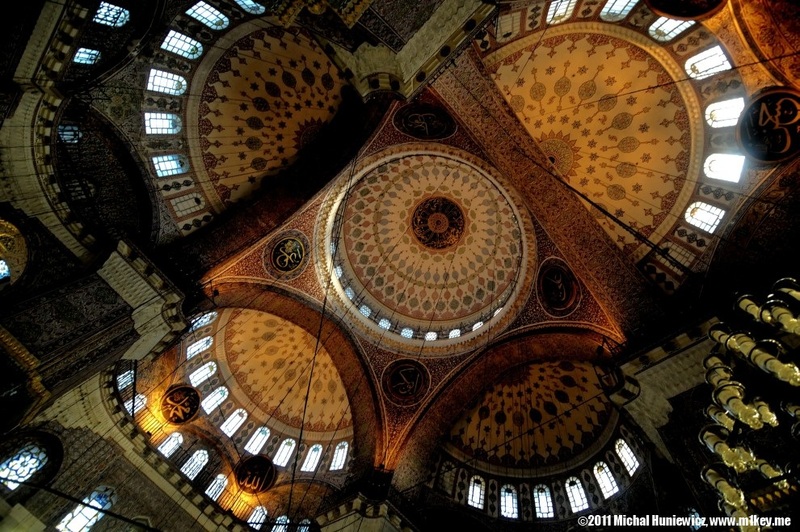 Hagia Sophia means great wisdom in Greek. This is where the imam delivers sermons. In some mosques opposite of the minbar is a platform (see previous picture) where the muezzin chants responses to the imam. 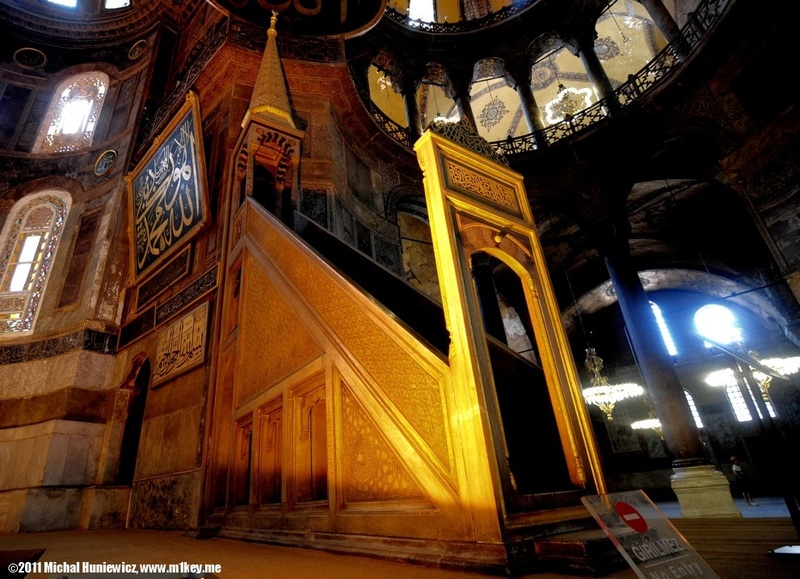 The minbar is an equivalent of Christian churches pulpits. This picture was taken near the Blue Mosque. 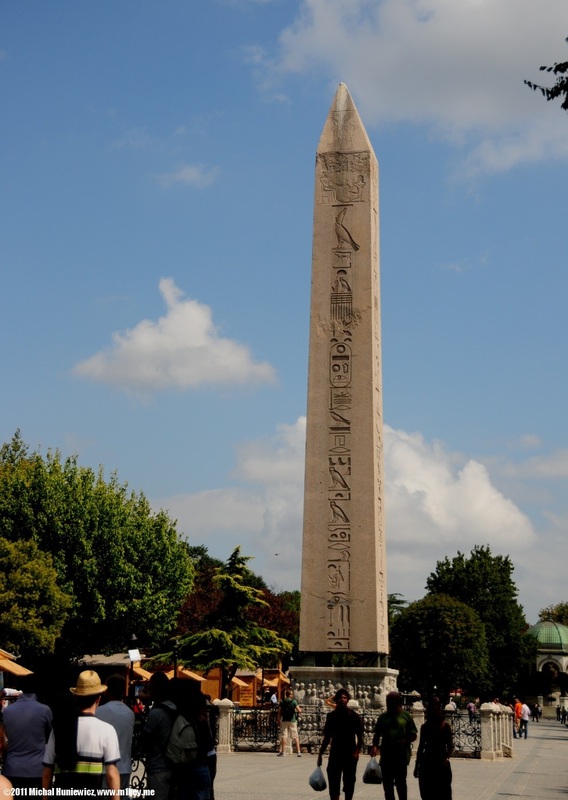 What you can see in the picture is the Obelisk of Theodosius, which is actually the Ancient Egyptian obelisk of Pharaoh Tutmoses III, re-erected by Theodosius I (a Roman emperor) in the 4th century AD. It was originally built in the 15th century BC! It describes and celebrates the victory of Tutmoses III on the banks of Euphrates in 1450 BC. Take a close look at the pedestal. It was created for the re-erection. You should be able to make out the emperor and his court. To the right you can see a bit of what is called the German Fountain (Alman Çeşmesi) and was built to commemorate Wilhelm II's visit to Istanbul in 1898. It was built in Germany and transported in pieces, to be reassembled where you can see it now. 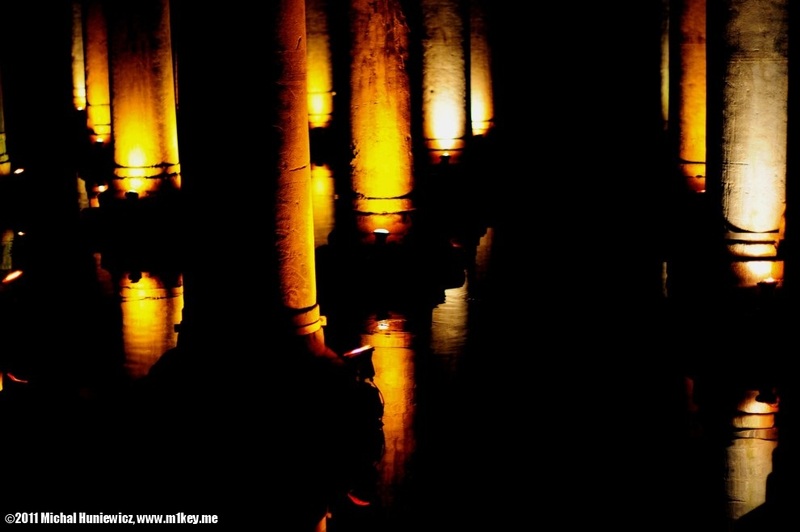 Ah, how cool and refreshing Yerebatan Sarnıcı ("sunken cistern") is to a tired visitor from the North! 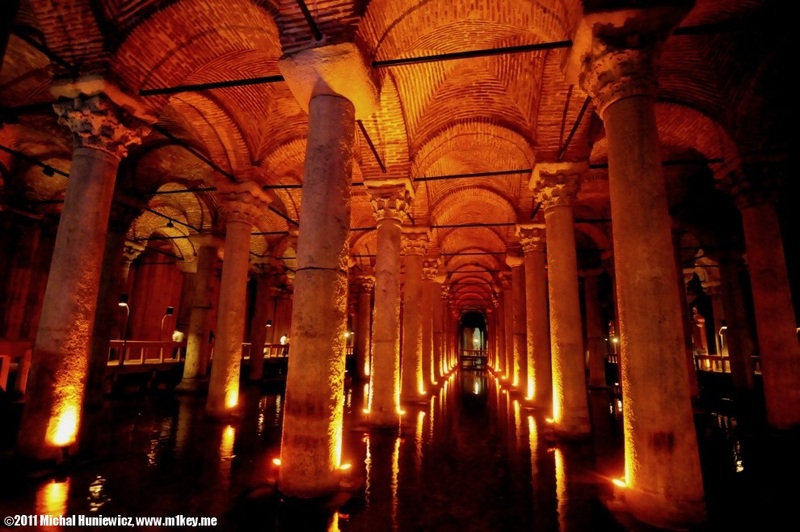 Built in the 6th century, it's actually one of several hundreds such cisterns under Istanbul. It provided a water filtration system well into modern times. According to historical sources, as many as 7 thousand slaves were involved in the construction. It can store up to 100,000 tons of water, but today it's almost empty - water might about a meter deep and you can see a lively fish community romping about. The columns supporting the arched ceiling of the cistern. The walls, by the way, are 4 meters thick and built using firebrick, which is a harsh purpose high endurace kind of brick. 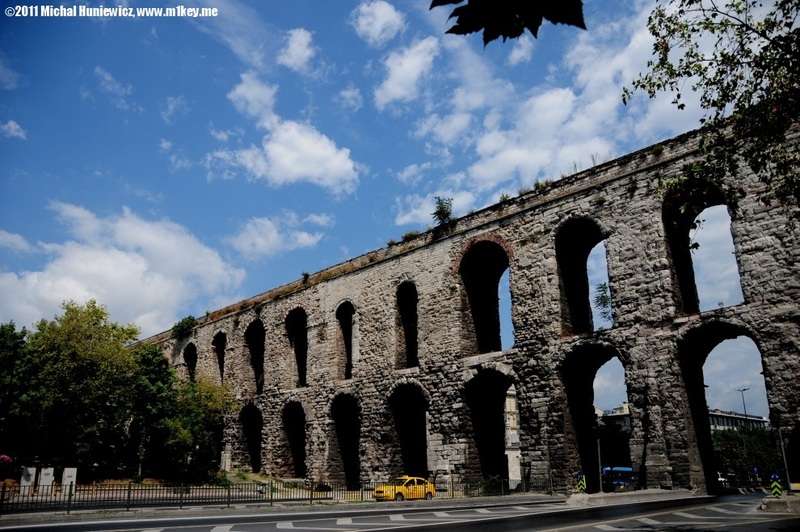 This aqueduct, located in the Fatih quarter, was built in the late 4th century AD and provided water for the city. What is left is 921 meters long, which is only 50 meters less than the original. 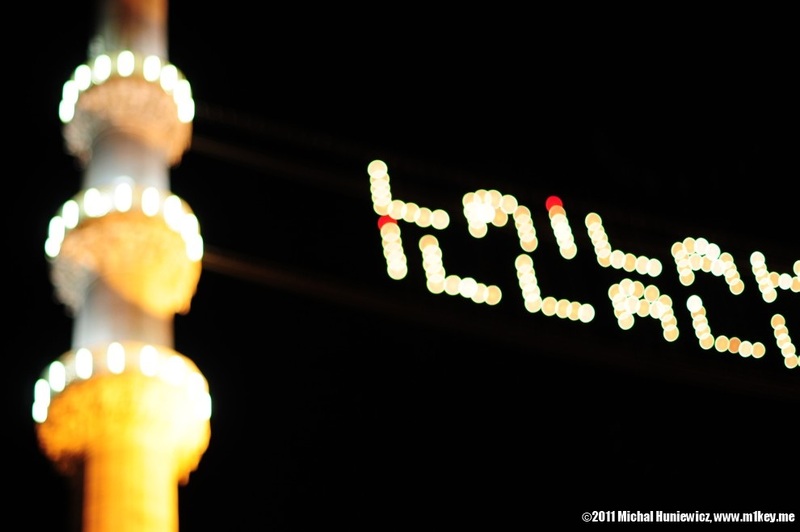 The maximum height is 29 meters, constant slope of 1:1000. A fine piece of engineering. This is a church built between the 11th and 12th century, later converted into a mosque, later into a museum. Only a small part of it is open now, but the entrance is cheap (5TL). 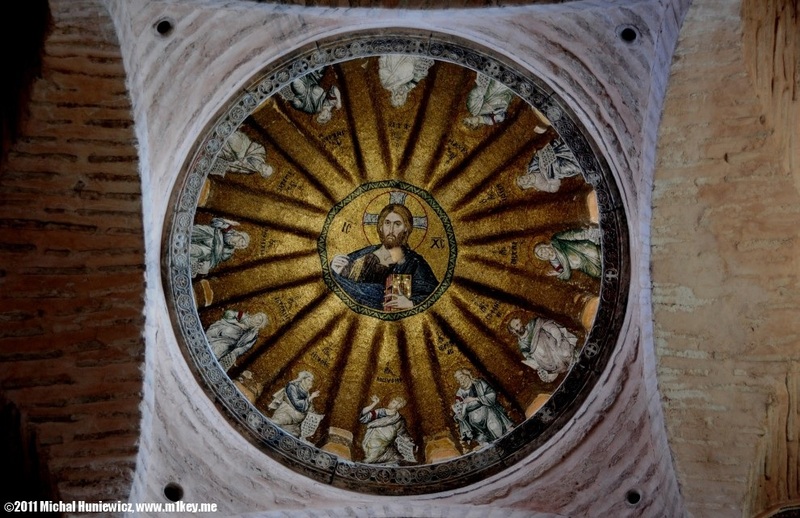 What's worth seeing are numerous Byzantine mosaics. The one you can see here is of Christ Pantocrator surrounded by the prophets of the Old Testament. Pantocrator means almighty (according to most translations at least). Christ Pantocrator is a central icon of the Eastern Orthodox Church. The place is called Fethiye Camii, which means mosque of the conquest in Turish. It's to commemorate to conquest of Georgia and Azerbaijan by the Sultan Murad III. The novel by Orhan Pamuk entitled My Name is Red takes place at his court. This is Rumelihisarı. Built quickly between 1451 and 1452 at the banks of the Bosphorus, before the conquest of Constantinople by the Ottoman Sultan Mehmed II, who therefore brought an end to the Byzantine Empire (and was 21 at the time). 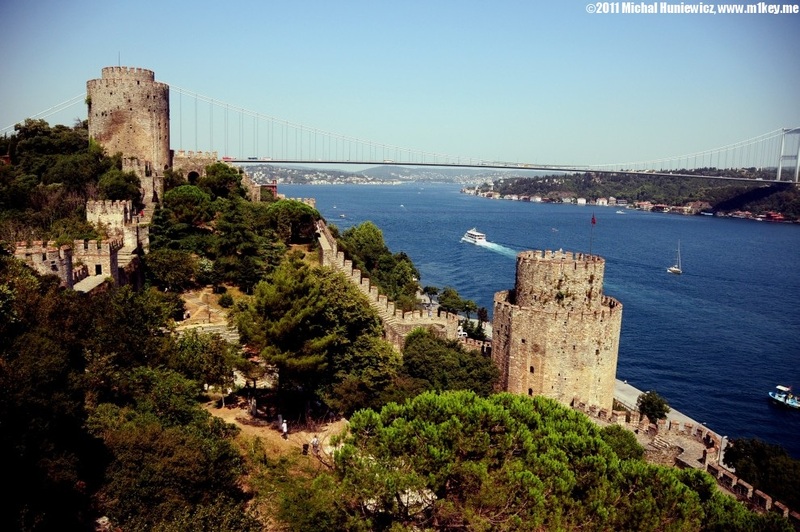 The fortress was built there to prevent help from the Black Sea reaching Constantinople during the siege. What you can see here is one of the three main towers, and a minaret shaft. The small amphitheatre still holds performances to this day. The bridge on the right is Fatih Sultan Mehmet Bridge, over 1.5km long, built in the 1980s. Tourists hiding in the shadow. 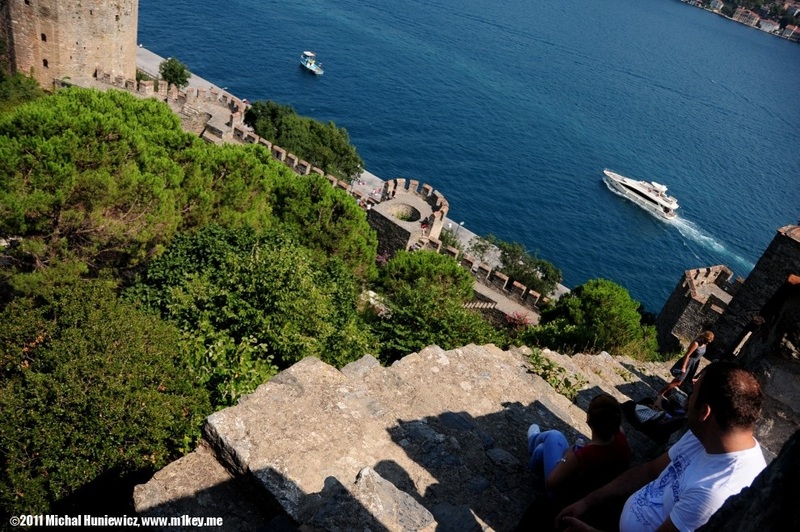 As you can see, there are no barriers at all and it's quite easy to fall, further increasing Mehmed II's death toll. Towers are impossible to visit now. You can only climb the stairs and reach the walls. The stones are so slippery that we joked the fortress would claim many casualties in an emergency before the battle actually started. Büyük Çamlıca is the highest (261m) point of the city and offers a decent view. It's located on the Asian side and is quite easily reached by bus, but you still have to walk for about 15 minutes (or take a cab if you're lazy). In the little forest seen here I saw a few lizards and a viper. 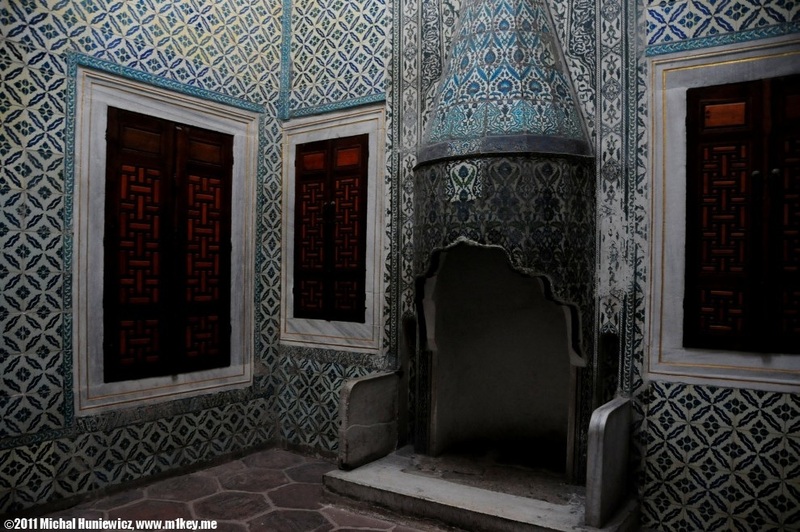 The harem is considered to be one of the most attractive things to see inside the Topkapı palace (in the palace, they also have what they claim is Moses' staff, Muhammad's beard etc.). I had very high expectations (typical among Western visitors) and the harem disappointed me greatly. It made a rather cold, unfriendly impression. Although it originally contained about 400 rooms (of which about a 100 remain), only the few main ones are available to see. It was home to the sultan's mother, the concubines and wives, but also the rest of the family and servants. It was guarded by eunuchs. Here's a favorite of the sultan. The concubines were, according to the sources, both beautiful and intelligent, so naturally there weren't many of them and they were brought there from all over the world. They could never enter or leave the harem without permission, so the harem was often referred to as a golden cage. The concubine chosen by the sultan would officially become a member of the dynasty. The harem was closed in 1923. Orhan Pamuk, in his book Istanbul. Memories of a City, describes an old woman he met in his childhood who actually was one of the last to leave the harem. 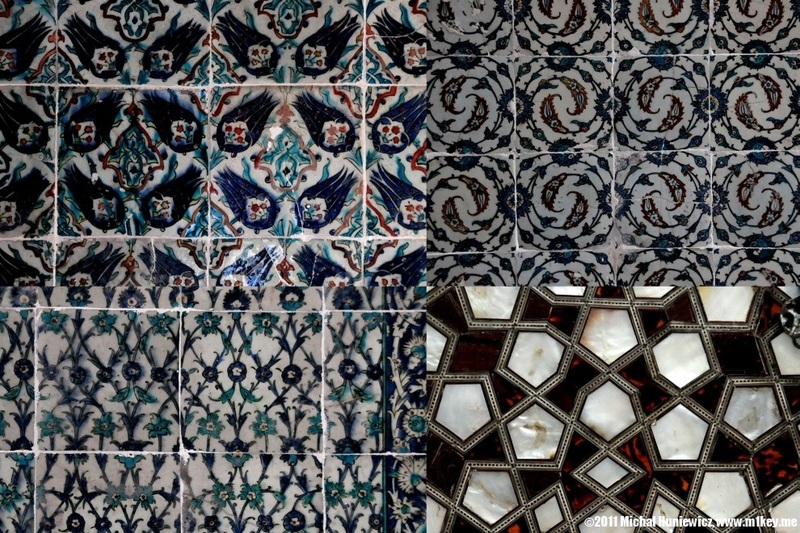 In the picture, various tiles from the harem walls. 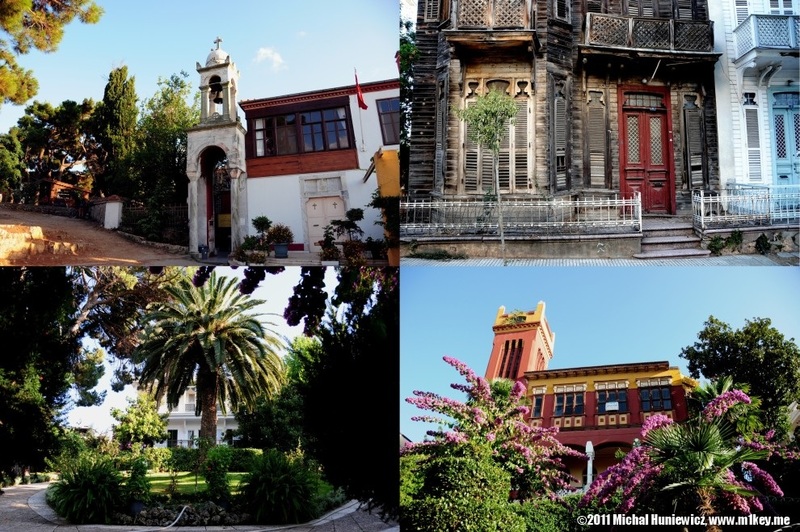 4 buildings from the Büyükada island located in the Sea of Marmara, not far from Istanbul. Büyükada is Turkish for big island. The building in the top left corner is the Orthodox church (Ayia Yorgi) located on top of the hill. One of the residents of the island was Leon Trotsky. 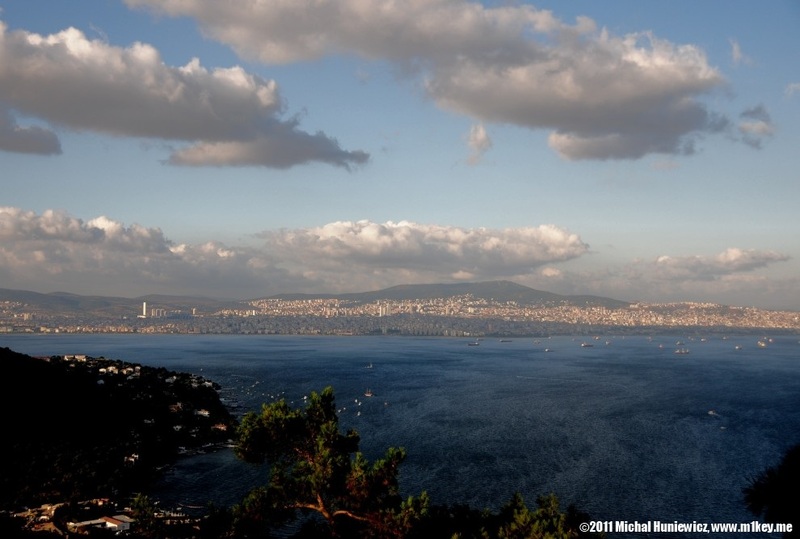 Istanbul, as seen from the top of the island of Büyükada. There are no cars on the island, so the only ways of transport to get there to the top are bikes (available to rent), horse carriages, donkeys you can ride, and (for the toughest or stingiest) your own two feet. The last 15-20 minutes are quite a steep walk and horse carriages don't even try going up there. On the top, there's the small Orthodox church (see previous picture) and this view. The Büyükada port. You can get to the island on a cruise boat or a regular transport boat (cheaper and quicker, but boring). The bridge (Galata Köprüsü) spans Golden Horn and connects Eminönü and the district of Galata. Here, seen at night, are various bars below the bridge. This is the first mosque we visited right after coming to Istanbul. Not sure if we were allowed to, we asked a policeman and he said "Sure! ", which was actually not so obvious to me - I was kicked out of several mosques in Tunisia, and my female friends were not allowed to enter. But in Turkey, there was no problem with us visiting. Everyone must take off their shoes before entering. 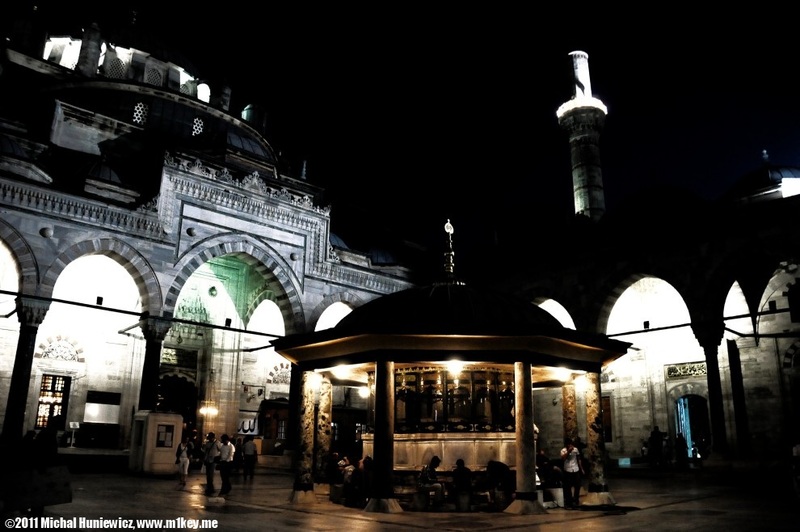 In the center, you can see an ablution fountain for performing wuḍhu - washing the feet in preparation for prayers. Yeni Camii or the New Mosque. The neighbourhood was predominantly Jewish when this mosque was built in the 17th century. Its main purpose was to increase Islamic influence which would in turn enable confiscating Jewish property. It was designed as a kulliye - a complex of facilities, such as baths, a hospital, a market and so on. The interior of the mosque is a 41m by 41m square. The dome you see is 17.5 m in diameter. It's interesting to know that this mosque was decorated with İznik tiles which are considered inferior to those used in imperial mosques. 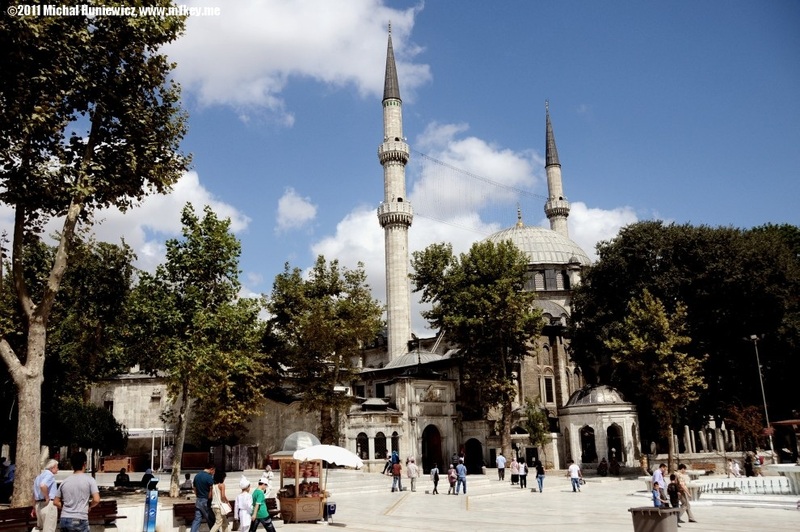 Eyüp Sultan Mosque is the first mosque built after the conquest of Constantinople. 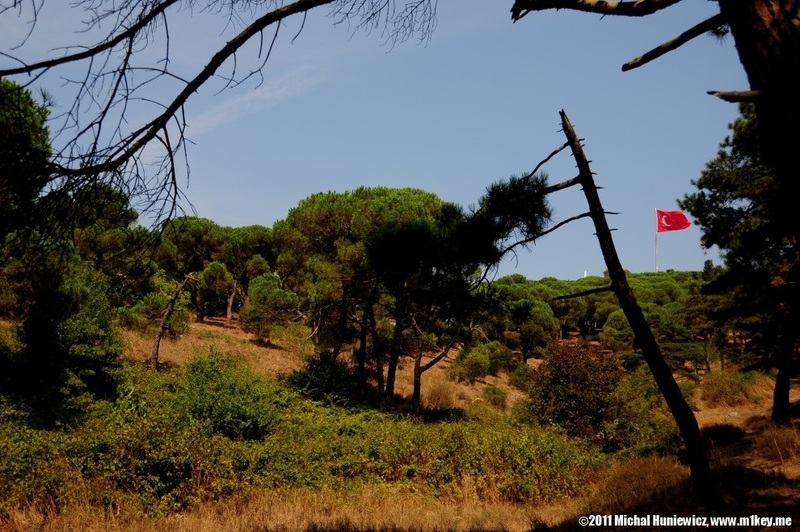 There is a very charming cemetery just next to it with beautiful views of the Golden Horn. 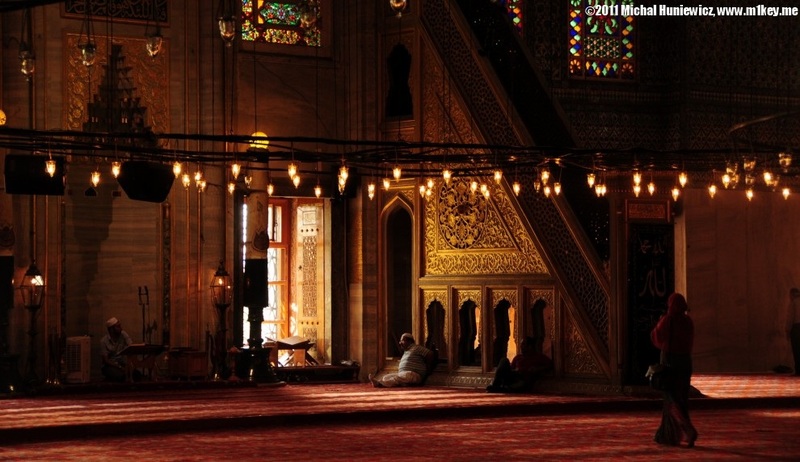 Built in the 16th century, this mosque is interesting for two reasons. One, it was built on a steep slope, which is challenging from an architectural point of view. Two, above the door, there is a fragment of the Kaaba in Mecca. 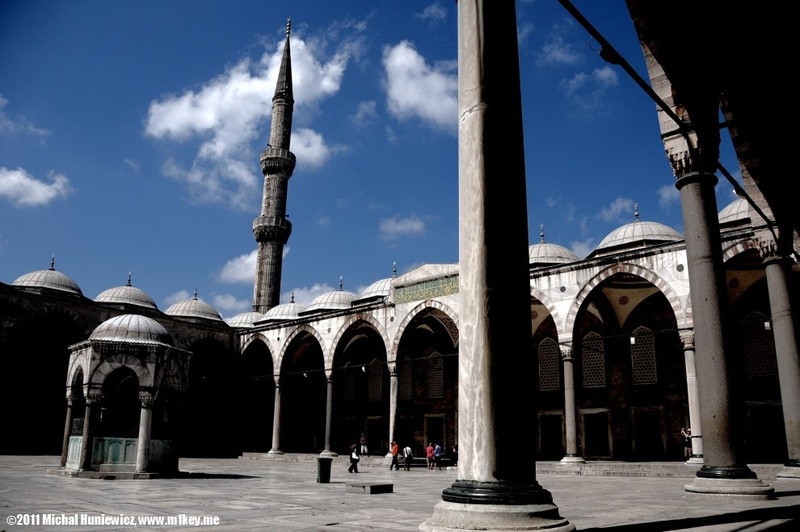 This is the inner courtyard of the Sultan Ahmed Mosque, also known as the Blue Mosque. Built in the early 17th century. Many mosques comprise the tomb of the founder, and this one is not an exception from this rule. Ahmed I, who died of typhus in 1617, is buried in a mausoleum outside the walls of the Blue Mosque. It's facing Hagia Sophia, next to what used to be the Hippodrome. In the upper part of the court entrance on the western side there is a heavy chain. In the old days, only the sultan was allowed to enter the court of the mosque on horseback. The sultan had to lower his head not to hit the chain, which was a symbollic gesture - even the emperor bows before God. The mihrab and minbar of the Blue Mosque. It's famous for having 6 minarets. We were told that the man in the left hand side is a newbie and just practicing, and that he would be replaced for formal prayers. The floor is, as in most mosques, a carpet. The mosque, unfortunately, smells of a million sweaty feet. The Bosphorus connects the Black Sea with the Sea of Marmara. It's 31 km long, 3,329 m wide at its widest, 704 m at its narrowest. West of it there's Europe, East - Asia. 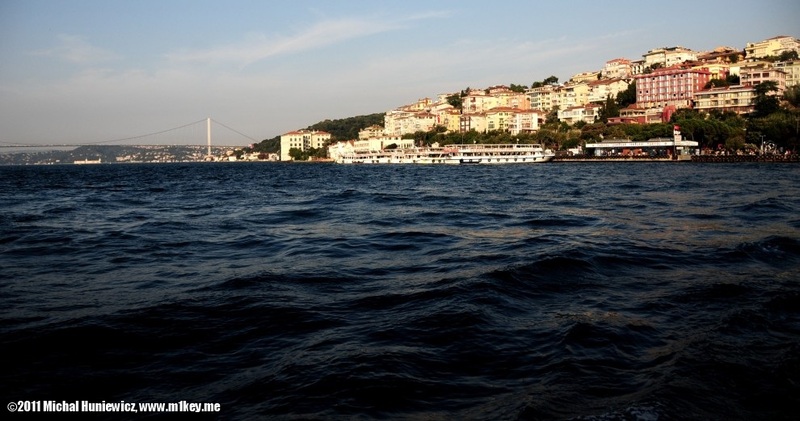 It has been recently discovered (2010) that under Bospohorus there is actually a huge underwater river. The Galata Tower seen from the Süleymaniye Mosque. This 66.9 m tall tower was built in 1348 AD. It may not be true, but according to a historian and traveller Evliya Çelebi, a legendary Ottoman aviator Hezârfen Ahmed Çelebi, flew from this tower in the 17th century using artificial wings, gliding over the Bosphorus and landing almost 6 km away. His brother, Lagari Hasan Çelebi, according to the same historian, performed the first flight with a rocket, gunpowder powered, in 1633. 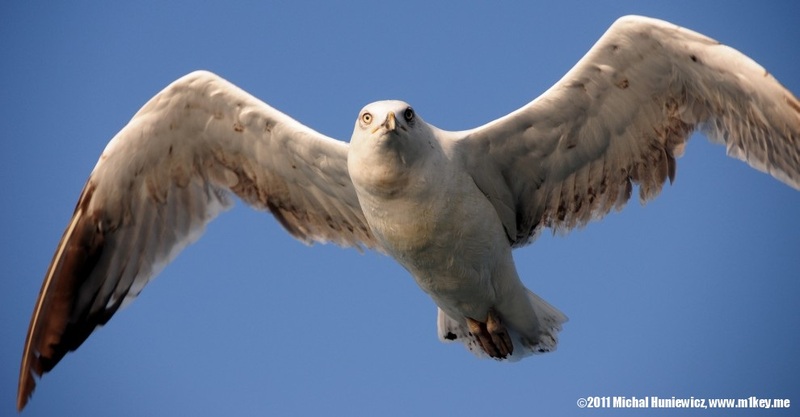 Today seagulls rule the skies of Istanbul. 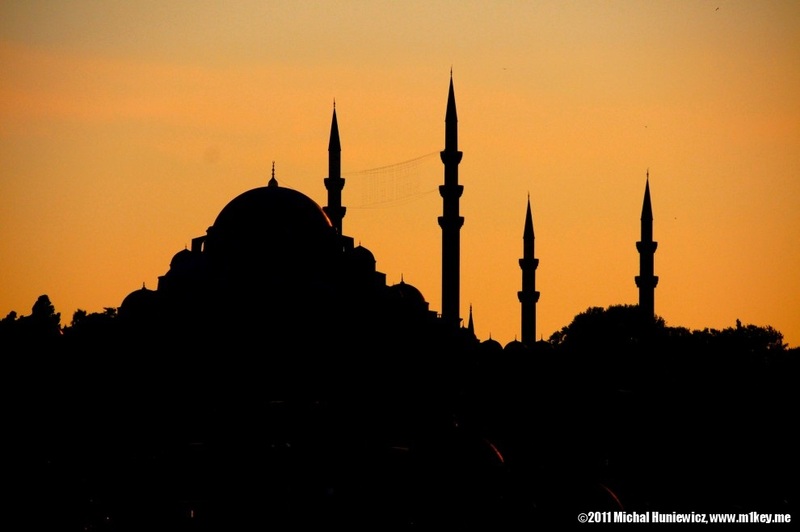 The Süleymaniye Mosque seen from the Bosphorus, taken from a ferry coming back from Asia to Europe in the evening.